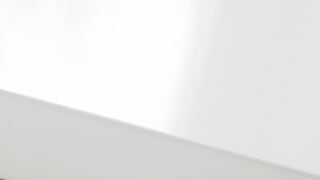 We all know that white gloss is a really stylish finish, but have you ever considered why it's so popular? We can think of a whole list of reasons! From the way it creates the illusion of more space by reflecting light, to how its clean lines and sleek appearance creates a minimalist yet luxurious feel; you can't really go wrong with white gloss furniture. 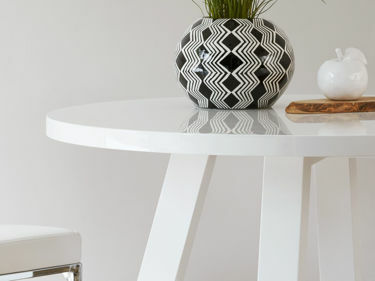 Created with family friendly dining in mind, the design features of the Arc Dining Table really showcase all the great qualities a white gloss finish has to offer. Measuring at 110cm in diameter and 75cm in height, the Arc Table can comfortably sit 4 people. This table has all the stability of a four legged table, but with the space friendly qualities of a pedestal design. This makes it a great space saver, ideal for squeezing in a couple more chairs when you have more people round for dinner! We wanted to include a round table in the range because round table tops are known for being very communal. This makes the table really suited to seating lots of family and friends, creating a relaxed and social space place to sit, eat and chat. The proportions of the legs are simple in style, yet they still feel substantial; in other words, the legs are slim enough that the table is not chunky but thick enough that it has both physical and visual strength. This results in a table that not only looks good, but has the support and stability behind it. What's really clever about this Arc Table is the engineering of the frame. The frame of the table actually crosses under the table top, rather than the legs just poking out. This keeps its simple appearance but does so in an elegant and thoughtful way. Adding the underframe gives this Arc Dining Table a stylish design feature alongside a ton of extra support and stability. 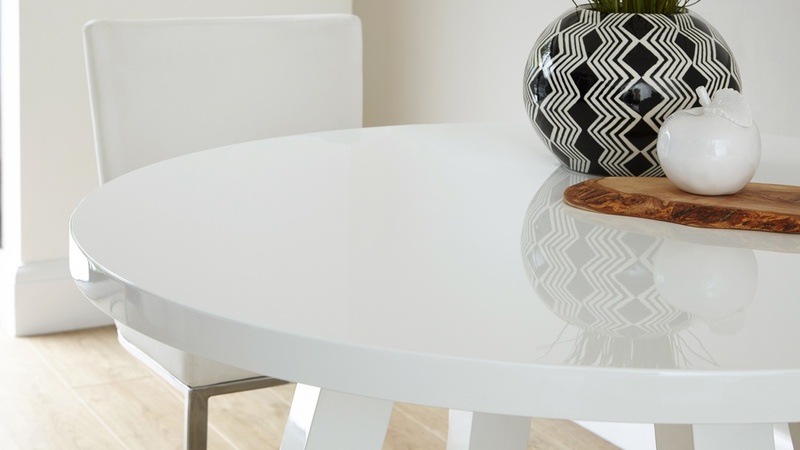 The Arc Dining Table is treated with 3 layers of white high gloss, dried for 24 hours each. The table is then polished by hand to really perfect its high shine. Every table is individually treated to ensure a hard finish that is highly reflective and durable. 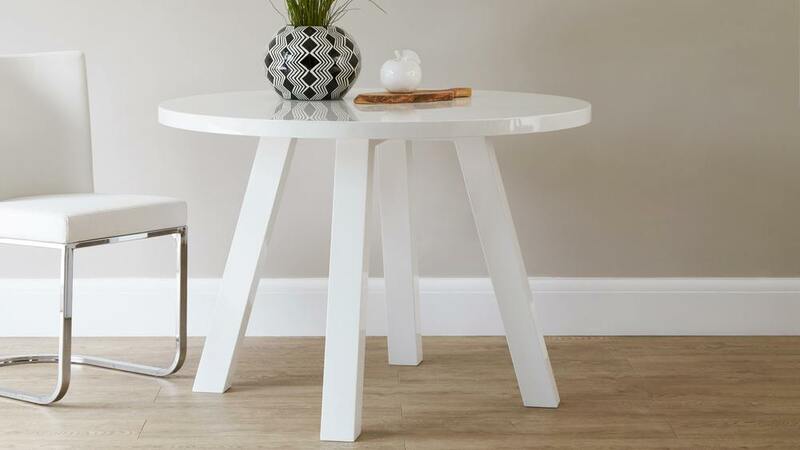 The Arc 4 Seater White Gloss Dining Table has been designed with style and practicality in mind. We also offer the Arc Round 4 Seater Glass and White Gloss Dining Table or the Zen 6 Seater White Gloss Dining Table for a similar style but larger table.